Touax Rail is certified according to ISO standard 9001. Touax strives to create value that can be sustained over the long term by meeting customer needs. Each and every Touax Rail employee is involved in and dedicated to achieving high quality standards. We want to win the trust of our customers by continuously listening to them, by understanding their expectations and consistently satisfying their needs. We enforce full compliance with the mandatory standards and principles of our Quality Management System, which include Change and Risk Management, rail safety, regulatory standards and quality requirements in every step of our Value Chain. Our pro-active approach to developing our tools and processes focuses on improvement of our customer service. Touax Quality policy fulfills our safety responsibility for wagon maintenance as ECM and wagon keeper. 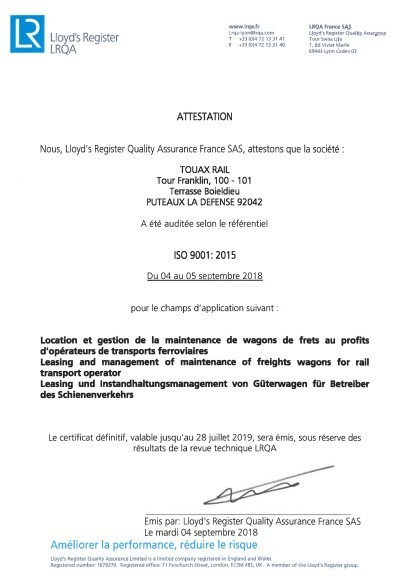 As ECM we help to reinforce freight wagon safety in Europe.